Removing murals from a building is ethically a dicy subject: a mural is site specific… Meaning that historically, it belongs on the wall it was painted on. Its part of the architecture. Theoretically, its removal is ethically wrong from an art history, art conservation, purist point of view. 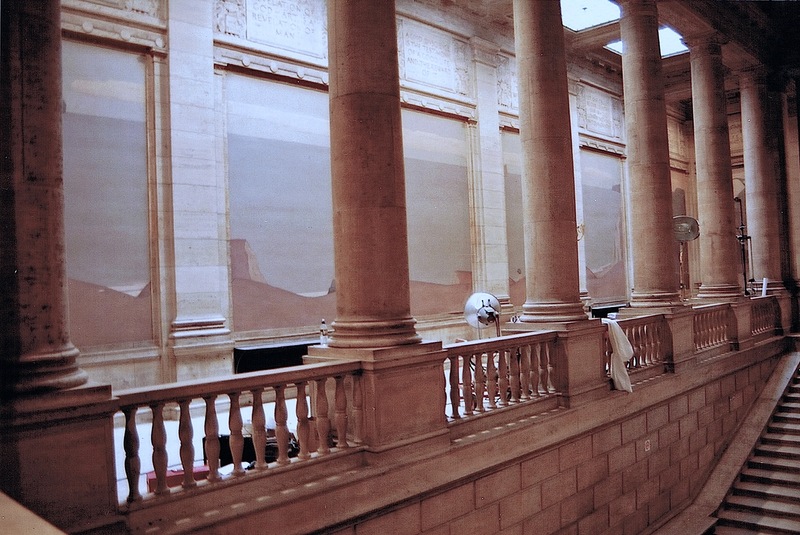 There are, however, circumstances where removal of murals from its intended location is justified… or even heroic! Some of these include demolition of buildings (or parts of), unstable structures and other conditions that run contrary to the preservation of the art. Even in questionable circumstances where the removal of the mural may not be justified… but it appears to be decided upon that the removal WILL take place (maybe for political reasons)… I am available to lend my expertise because I believe the best result for the artwork is more likely to happen with my help than without it. I am often asked by contractors and architects what is involved and how much it will cost to remove a mural… over the phone, without even seeing the mural! My answer to this unanswerable question is this video. This video is made for architects, project planners and general contractors planning jobs where murals may be involved. However, the information should be very interesting for anyone interested in the arts, historic preservation, art history. Thank you so very much for talking with me about rescuing a mural in our house. You reaffirmed our family’s approach as well as added very valuable information such as the possibility of tax benefits and/or the help of our local university. Your excellent work and willingness to consult over the phone are very much appreciated! Wow, this looks like delicate surgery. Hi Scott. My childhood home was recently sold and is in the process of being demolished. We have 13 murals painted in the early 1920’s and I’m desperate to save them. These murals are painted directly on the wall without a canvas. Some have significant cracks and paint flaking off. How can we go about saving them? do we cut them directly off the wall? Thank you so much for your help with letting me know exactly how to roll a removed mural!!! Sir, you are amazing and kind! Thank you a million time over!!! Lorena, thanks for leaving your question and comment! As you can see, its often a complex job and the, “guiding light,” if you will is the safety of the artwork. Obviously, as you can see from our website, we deal mostly with historic murals. But I would be happy to discuss your project with you… or perhaps better yet, your daughter… if you want to call me. 805 570 4140 mobile, 805 564 3438 office. There are so many variables that I don’t discuss these types of matters via email/in writing. Hi! My daughter painted a mural on a wall in our house. We are planning on moving and hate to leave it behind or paint over the mural. She used acrylic paint. It’s an awesome piece and she now kicks herself for not doing it on canvas. Any ideas would be appreciated. I would really hate to have to paint over it and lose the piece all together. Thank you for all the information you have published. Thank for reaching out. Let’s talk about the many problems that await and the decisions that need to be made. Can you give me a call? Today, Fri. I am out of range but from tomorrow onward you can reach me on my phone. I’m in Mountain Time at the moment. I am an artist and have been asked to remove a WPA Mural from a post office that is going to be demolished. The mural needs to have a cushion application to prevent paint from flaking. What is the product you recommend tor this. The paint is very thin oil. Hi Taylor, thanks for your question. There is no Home Depot mural removal pack that is available. From your experience with an affresco in Italy, you would have been, perhaps, involved in the decisions making process of what materials to use based on certain conditions: flaking paint, intonacchino or not, how thick is the arriccio, where are you separating the plaster layers, are there oil or tempera details, strappo, stacco, stacco massiccio, extent of previous restorations, is the project located outside or in an enclosed public place? And then the processes change completely when it comes to contemporary art. The decisions are many before you decide on which materials to use.To my knowledge, there is no book or guide for making those decisions. These are, of course, nuts and bolts questions. But perhaps more importantly are the ethics of mural removal and destroying an element of the architectural and historical fabric. We NEVER remove murals unless they are threatened by demolition or something similar level of distruction. Awesome write-up. I’m a normal visitor of your website and appreciate you taking the time to maintain the excellent site. I will be a frequent visitor for a really long time… your work kind of reminds me of Daniel Silva’s books whose main character is Gabriel Allon, a legendary spy and art restorer. Very cool. Very nice, thanks for sharing, often wondered how (or even if) wall murals could be removed. There are many historic places across the world where preservation cannot be priority for the state due to economic circumstances. Many artifacts and historic paintings go into ruin. Great info on removing murals! This was very much needed for helping us think about a project in our office.. Thanks Dennis. Call me anytime to chat. woow …Its just amazing .. This information and video is invaluable. Thank you so much for sharing. I may get asked this question by my customers, and I can refer them to this website for more information. Thanks so much. 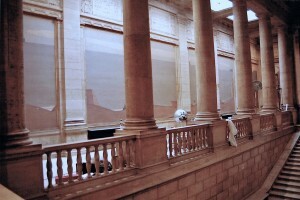 I have a client who needs a mural moved from one part of a Beaux Arts building to another. Winfield Gallery in Carmel said you are the mural expert. I can see by the video he was right! Can we discuss my questions? Thanks for the video. During my MFA studies in art history we never talked about or saw this aspect of art, saving saving art or art conservation. Super interesting. Great info and very important for our evaluation for a subcontractor. We need a person like you that understands murals, working on a contraction project environment and is very professional. Thanks. Thanks Hans for your comment. I’ve been posting videos that show different aspects of working with paintings. For more entertaining videos see my YouTube channel at “bestartdoc” I’m in the process right now of showing how we repair HUGE rips in canvas paintings and we’ll be starting a graffiti removal project off of a famous mural this next week. I’ll be making a video about that too. So, stay in touch. This video was extremely interesting. Recently they removed an E.J. Hughes Mural from the old Malaspina Hotel here in Nanaimo, BC. It took the conservator about one year to restore it to its previous glory. It had been walled off for many years. Your video helped me understand exactly what some of the things need to be considered and done to preserve or remove a mural. Thank you very much for taking the time to share your knowledge. I for one would love to see an online course taught on various aspects of conservation. Here’s hoping you’ll consider doing this. You’ve done a great job. I’m amazed at the expertise required and thanks for helping me to identify red flags that could really cost us. This vid should be required viewing for all contractors who work on historic properties… that is to say, watch this video… maybe several times like I did! Thanks for this info which will be very useful as our firm considers historic preservation projects with murals. I’ve never heard of this info you’ve shown in this video. Amazing.